Injuries have contributed to Brian Cody making five changes to the Kilkenny side for Sunday’s Semple Stadium showdown with Tipperary. Back In Action: Brian Hogan and Eoin Larkin return for the Cats. KILKENNY BOSS BRIAN Cody has named his side for Sunday’s eagerly-awaited clash with Tipperary. Murphy, who was a newcomer for the opening round against Galway in Pearse Stadium, is unavailable after suffering concussion when lining out in attack for Waterford IT in last weekend’s Fitzgibbon Cup semi-final defeat against Mary Immaculate College. Last year’s All-Ireland winning net minder David Herity replaces Murphy in goal. The experienced Brian Hogan mans the heart of the defence with Kieran Joyce making way. Paddy Hogan comes in at left half-back with Conor Fogarty moving back to the corner instead of Tyrrell. In attack Mark Kelly and Eoin Larkin come into the half-forward positions with Michael Fennelly and Tom Breen the players that are replaced. Positional switches see Matthew Ruth going to midfield, Richie Power move to centre-forward, Colin Fennelly – who will captain the team – switched to full-forward and Richie Hogan is named at left corner-forward. 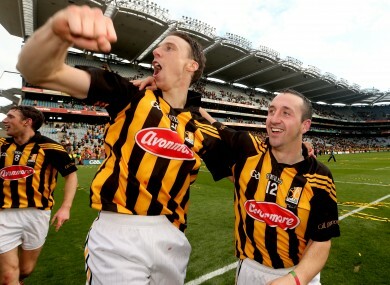 There are nine survivors from the Kilkenny team that were comfortable victors over Tipperary in last August’s All-Ireland semi-final in Croke Park – Herity, Paul Murphy, JJ Delaney, Tommy Walsh, Brian Hogan, Power, Larkin, Colin Fennelly and Fogarty. KILKENNY: David Herity (Dunnamaggin); Paul Murphy (Danesfort), JJ Delaney (Fenians), Conor Fogarty (Erins Own); Tommy Walsh (Tullaroan), Brian Hogan (O’Loughlin Gaels), Paddy Hogan (Danesfort); Lester Ryan (Clara), Matthew Ruth (James Stephens); Mark Kelly (O’Loughlin Gaels), Richie Power (Carrickshock), Eoin Larkin (James Stephens); Aidan Fogarty (Emeralds), Colin Fennelly (Ballyhale Shamrocks), Richie Horgan (Danesfort). The Kilkenny substitutes for Sunday’s game have also been named with some new faces selected to occupy places on the bench that were not involved against Galway. Richie Reid, younger brother of TJ, is the substitute goalkeeper while Brian Kennedy and Ger Aylward from the Kilkenny U21 team that lost last September’s All-Ireland final against Clare are also included. The experienced John Tennyson, who featured for UCD in last weekend’s Fitzgibbon Cup semi-final defeat to UCC, is also selected. Subs: Richie Reid (Ballyhale Shamrocks), Kieran Joyce (Rower-Inistioge), Ger Aylward (Glenmore), John Tennyson (Carrickshock), Willie Phelan (Dunnamaggin), Tom Breen (St Martin’s), Mark Bergin (O’Loughlin Gaels), Brian Kennedy (St Lachtain’s), Tomas Keogh (James Stephens), Padraig Walsh (Tullaroan). Along with the trio of Murphy, Tyrrell and Fennelly, injuries continue to rule out Henry Shefflin, TJ Reid and Michael Rice. While Cillian Buckley and Walter Walsh, who both did feature for UCD during that Fitzgibbon Cup semi-final in Galway, are also sidelined on this occasion. Email “Brian Hogan and Eoin Larkin back for the Cats”. Feedback on “Brian Hogan and Eoin Larkin back for the Cats”.